In order to place your student and to measure student progress, we are asking that your student takes the Performance Series Placement Test. This test is completed online and takes about an hour for each test. The test will be available within 72 hours of enrollment. Please use the information at the top of this document to access the testing site. For students in Kindergarten through 5th Grade, a headset or computer microphone is required. For the reading and math foundations questions on the test, the questions are read aloud to the students as well as the answer choices. The questions in the math test are designed so that a calculator is not necessary. Bridgeway Academy’s policy is that calculators are NOT to be used for Performance Series Placement testing. Use the chart below to determine which tests your student should complete. Make sure that students are working alone on the test, without assistance or coaching, to allow valid results. 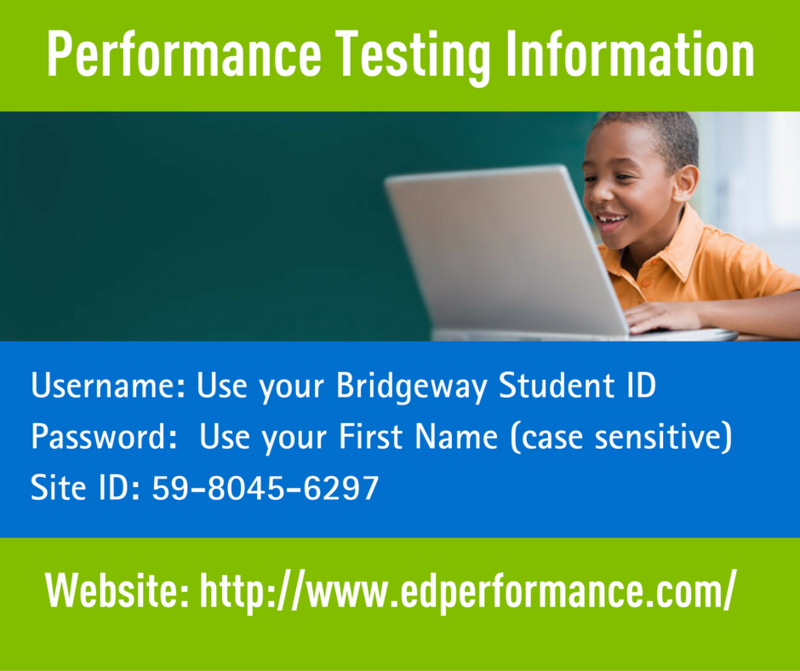 Student data can be accessed by Bridgeway Academy only when a student finishes his/her test completely. When completely finished with the test, a congratulatory message appears on the screen. If your student tries to go too fast through the test, the test may “spoil.” If this occurs, you will see the message, “Your test has ended.” Otherwise, when your student completes the test, they will see the message “Congratulations, you have completed the test. Make sure all students—especially higher-performing students—understand the different test questions and lengths, and that they are expected to get some questions wrong. IMPORTANT: You must allow pop-ups in your web browser in order for the test to work properly. During the reading test, the passages will remain on the screen once you begin answering questions, so the student can refer back to it, but they MUST read the passage first before beginning answering questions. Please have your student take the math test first, followed by reading and language arts. Do you have pop-ups disabled? Are you going through the test too quickly causing the test to spoil? If the test is freezing - it may be the tutorial that is being prevented from playing by your firewall. Check their firewall settings - you can also let your advisor know and your advisor can play through the tutorial for you and then you can continue after the tutorial is complete. If the screen is cutting off the reading the test, make sure the mouse is within the text in order for you to be able to scroll down.